Imperialâs moment of submission came last Sunday at Marine Park C in Brooklyn, New York, beaten by St Lucia. Imperial batting first made 163 all out. Foster Lewis made 60, Bjorn Brown 36 and Don Parris 22. Batting for St Lucia, Victor Mangal had 4 for 26 and Richard Moncherry took 2 for 28. St Lucia replied with 165 for 5. Creed Fontanelli made 66, Jacob Emmanuel 28 and Libert Serieux 28 not out. Bowling for the dethroned champions, champs Byron Mars grabbed 3 for 38. 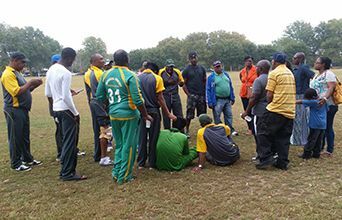 In getting to the final, Imperial had overcome another Vincentian team, Middlesex, on Saturday, also at Marine Park C.
Imperial posted 236 for 9 in 35 overs. Former St Vincent and the Grenadines player Clarence Wyllie smashed 132. He was supported by Foster Lewis and Gamal Cunningham, who contributed 31 and 30 respectively. Bowling for Middlesex, Kavir Singh had 3 for 32 and Leon Hyde â 2 for 62. In reply, Middlesex, despite a valiant fight to the finish, fell short, making 222 for 9 in their 35 overs. Mark Audain with 62, Leon Hyde 45, not out and David Anthony, 21, all contributed, but it was not enough. Roy Bryan, 2 for 46, Byron Mars, 2 for 36, and Augustus Mofford, 2 for 31, bowled their team into the final. In the other semi-final, on Saturday, St Lucia defeated another Vincentian outfit â Queensbury, to make it to Sundayâs final. Following the match, president of the BCL John Wilson thanked his executive members who worked behind the scenes and all others for their support during the season, despite the obstacles. He also took the opportunity to speak about the leagueâs hopes of having more teams joining the Brooklyn league for 2015. Wilson listed some teams like Wanderers, which he projected would return next year. âWith these teams and some new ones they are hoping to have fourteen teams next yearâ¦ we are working hard to ensure the teams get on board before the end of the year,â Wilson projected . âItâs not easy to run the Brooklyn Cricket League financially, due to the limited number of teamsâ¦ We were limited with finances,â Wilson explained.